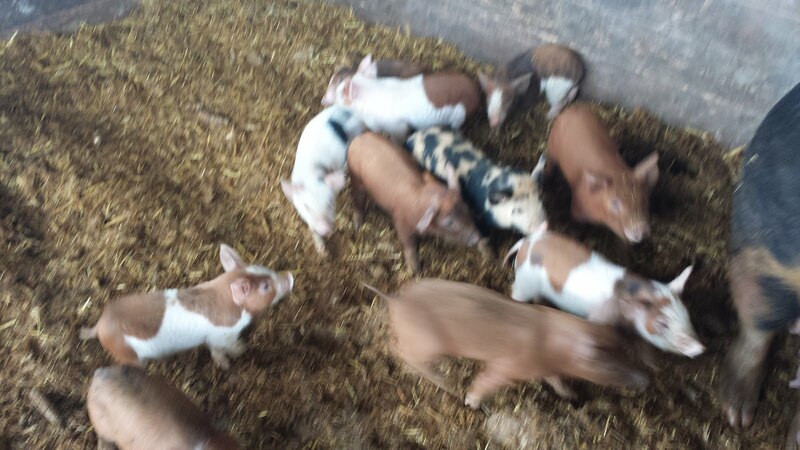 What is overgrazing when it comes to pigs - or any animal, really? Walter Jefferies over at Sugar Mountain Farm has made promoting pastured pigs his main enterprise for the last 10 years, and he's reached a lot of people with that message. But every now and then I think he goes off key. 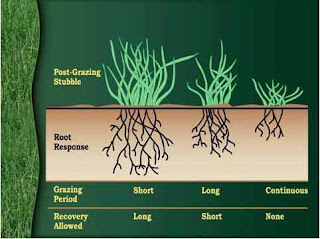 The hardest part of putting animals out to graze is learning how to graze to get the best production of forage off of your land. 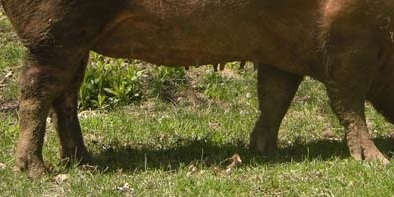 How fast the animals eat, what they eat, how much damage the hooves do to the ground, and the weather are all factors. The grass in this picture is less than 1" tall, and is sparse. there's a fair bit of rock and bare dirt showing in the picture, and honestly, this looks overgrazed to my eye. Why do I say that? 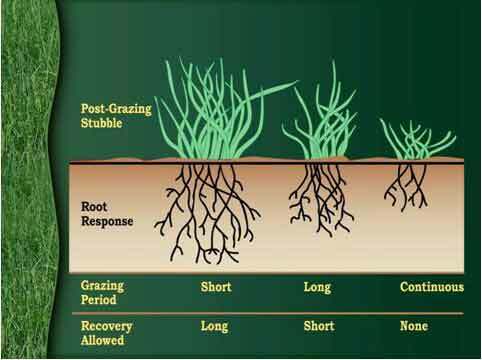 As you can see from the picture above, the roots of the grass are very likely very short, and the total energy that the plant has -- energy used for survival, growth and recovery - is likely to be pretty low, too. Ideally when you're done with animals grazing there's going to be a good length of forage still available. The picture that Walter promotes as his practices doesn't show much of any stubble left. In the picture above you can see cattle to the left that are on new ground; just grazing, and a grazed area to the right. With a rotational grazing system - which requires a fair bit of work, both with extra fencing and extra management to move the animals from place to place on time - you can keep your forage in good condition, and double or treble the amount of forage actually produced. 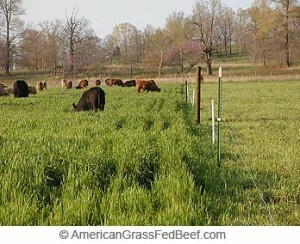 Most of the folks that I know that manage animals on pasture don't consider continous grazing to be a best-practice. It is simpler and cheaper - less fence, and less labor - but the results aren't as good as is possible with even a rudimentary rotation system. As always, when you see something promoted on the internet, take it with a grain of salt. So the flu ran its course; roughly 3 weeks of feeling terrible, then a whole bunch of non-farm stuff like federal tax return prep and some other business stuff, and some county-government stuff, and then some farm work. 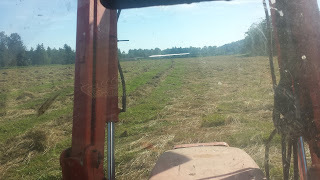 I've been cutting and raking and tedding 60 acres of orchard grass/alfalfa hay, and will be bailing it tommorow (6-7-2016). Scheduled in a crew to help me put it in the barn. No idea on bale count; somewhere around 2,000 bales - the forage has been growing great, the hard part has been finding the right weather window to put it all away. Seed corn got delayed in delivery, so I'm 3 weeks behind where I'd like to be, but I think it'll be fine. 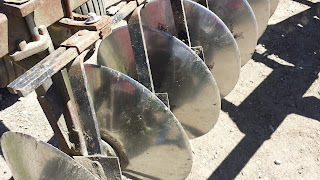 I'm planting seed corn from alseed.com (albert lee seed company) and picking a shorter season variety to give it the best chance to dry down. I'm planting 10 acres more corn this year than last, which people in iowa will laugh at - "what, 10 acres? we plant that on our morning coffee break!" - but for me it's a 25% jump in production and I'll use that corn to feed the hogs this winter. I'm pretty much fully equipped to handle the corn - disc, planter, seeder, combine, grain dryer, storage bin. the only thing that I can think that I need is a long auger to load the storage bin, so I'm looking around for one of those. I purchased a laser land leveler implement, and my intention is to use it to level areas of my fields as I till them so that I can flood irrigate out of the manure lagoon. I'll write it up and do some videos after I get the hay in the barn. Had some baler issues today or I'd be baling today. Since I couldn't bale I planted the corn.